Saddle pulmonary embolism is a type of disorder that can cause blood clot in the lungs. However the word saddle refers to the fact that there are two branches of the main artery that moves across the each part of the lungs. Embolism actually refers to a blood clot that can appear right between the main arteries of the lungs. In this particular problem, the patient will have the embolism that means there will be a clot in the lungs. The problem can be life threatening to the patient if left untreated. In Saddle pulmonary embolism blood clot restricts the passage of blood to circulate in lungs. Once there is a blockage, it mean blood circulation become poor in lungs area, that certainly means insufficient amount of carbon dioxide to escape through the air sacs. The same case with the oxygen as required amount of the oxygen does not enter the lungs. 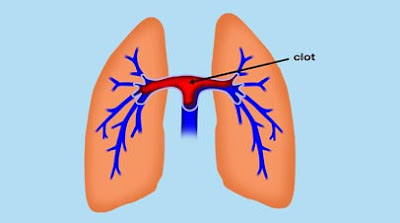 In some of the cases, the size of the clot can be large; the large sized clot can make the blood to move to the lungs. In such cases patient cannot survive at all. There are some obvious symptoms that can be observed. When there is saddle pulmonary embolism, there is a shortening of the breath that can get worse. Patient suffering from the disease can have a heavy chest and in some case there is sharp pain in the chest. Cough is quite common in such cases but with the cough blood can be seen as a symptom. There will be shortening of the breath as well as consistent chest pain. Patients suffering from the problem can have inhaling and exhaling issues at the same time. One of the definite causes of the Saddle pulmonary embolism is DVT. The DVT stands for deep vein thrombosis. In DVT, a blood clot is actually formed; the origin of the clot can be between the legs and the pelvis. More importantly the clot can travel anywhere in the body, is most of the case the clot travels upwards towards the lungs. Once the clot reaches the lungs it can cause severe blockage in the main artery of the lungs. Once the artery is blocked it is called pulmonary embolism. There are multiple factors that can trigger DVT. If you are overweight and you smoke, then you are more prone to DVT. Like other disease, the Saddle pulmonary embolism can also be treated. There are anticoagulant used, these anticoagulant are actually called blood thinners. Once the blood is thinner enough it can cause the clot to dissolve or move. There are enzymatic medications that can also be suggested to the patient suffering from the disease. The enzymatic medicines can prevent the blood to have the clot. There are various type of the filters used, these filters can actually prevent the blood to have the clot. There are only few cases in which surgery is recommended to the patients, but that is very rare.